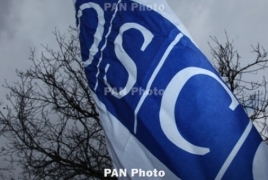 PanARMENIAN.Net - The co-chairs of the OSCE Minsk Group issued a statement on Saturday, March 9, urging the parties to the Nagorno Karabakh conflict to "minimize inflammatory rhetoric." In their March 1 statement, the co-chairs (Igor Popov of the Russian Federation, Stephane Visconti of France and Andrew Schofer of the United States of America) welcomed the commitment of Azerbaijani President Ilham Aliyev and Armenian Prime Minister Nikol Pashinyan to meet soon under their auspices. The mediators, working closely with the two foreign ministers, have been making preparations for the summit, which will be the first direct contact between the two leaders conducted under co-chair auspices. In the new message, the co-chairs underlined the importance of maintaining an environment conducive to productive discussions and continue to assess positively the recent lack of casualties on the front lines.They also said they welcome some initial steps being taken in the region to prepare the populations for peace and encourage the sides to intensify such efforts. At the same time, the co-chairs reiterate the critical importance of reducing tensions and minimizing inflammatory rhetoric. In this context, they urge the sides to refrain from statements and actions suggesting significant changes to the situation on the ground, prejudging the outcome of or setting conditions for future talks, demanding unilateral changes to the format without agreement of the other party, or indicating readiness to renew active hostilities," reads the statement. "With reference to some contradictory recent public statements on the substance of the Minsk Group process, the co-chairs reiterate that a fair and lasting settlement must be based on the core principles of the Helsinki Final Act, including in particular the non-use or threat of force, territorial integrity, and the equal rights and self-determination of peoples. It also should embrace additional elements as proposed by the Presidents of the co-chair countries in 2009-2012, including: return of the territories surrounding Nagorno-Karabakh to Azerbaijani control; an interim status for Nagorno-Karabakh providing guarantees for security and self-governance; a corridor linking Armenia to Nagorno-Karabakh; future determination of the final legal status of Nagorno-Karabakh through a legally binding expression of will; the right of all internally displaced persons and refugees to return to their former places of residence; and international security guarantees that would include a peacekeeping operation. The OSCE envoys said are prepared to meet with the leaders and foreign ministers of Armenia and Azerbaijan at any time, and call on the leaders to resume negotiations in good faith at the earliest opportunity. Continuous and direct dialogue between Baku and Yerevan conducted under the auspices of the co-chairs remains an essential element in building confidence and advancing the peace process. "The co-chairs will also continue to discuss, as appropriate, relevant issues with the interested parties directly affected by the conflict, recognizing that their views and concerns must be taken into account for any negotiated solution to succeed," the mediators said, stressing that they remain fully committed, in accordance with their mandate, to helping the sides find a peaceful solution to the conflict.